The Sega Genesis (aka Mega Drive) is the most popular console ever produced by Sega. It's unique library of games contains literally dozens of major hits. And the Genesis era was a high water mark for Sega, a time of great popularity and success, as Sega took the gaming world by storm. 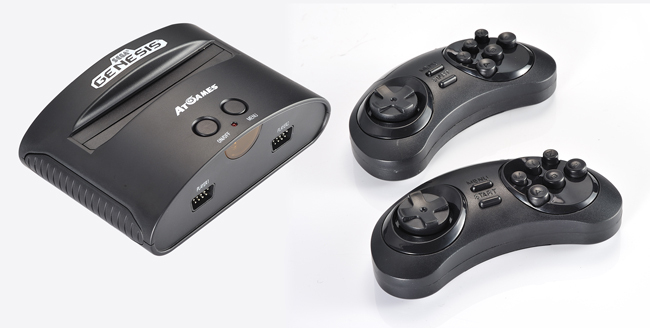 AtGames has attempted to keep the legacy of the Sega Genesis alive with two interesting new products. 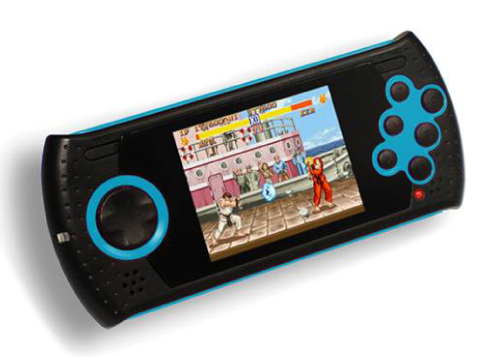 AtGames has given Sega Genesis fans two ways to play with the Sega Genesis classic console and it's hand held cousin the Sega Genesis Ultimate Portable. You're covered whether you're gaming at home or travelling abroad. Each system is powered by a "console on a chip" hardware. And each unit comes with a wide selection of games that are 98% the same as each other. That's why we have decided to review these two products together, so that our readers can decide which product is best for them. After reading this review, there may be some die hard Sega fans that still want both products. Having spent ample time with each system, I can say they definitely have their own strengths, but there is also a lot of cross over between the two products. The console is bundled with two wireless controllers and 80 built in games. The wireless controllers can be used to select a game, reset, and return to the system menu. The standard bundle also includes an AC adapter and AV cords. Wired controllers are also available on the AtGames website. The handheld comes with built in rechargeable batteries and a USB charging cable. You can buy an AC adapter separately on the AtGames website. The system also has TV out support however, a TV out cable is not included in the basic package, and must be purchased separately. The portable has a beautiful screen that's bright and rich with color. On the audio front, the sound is a bit canned, but it does the job. However, the best feature of this system is the SD card support. This allows users to play Sega Genesis roms from an SD card. The games must be in a folder called "games" and they must also be in the ".bin" format. We tested dozens of games, and although there were a few that did not work, we were surprised by the high compatibility rate. The console features two wireless Genesis six button style controllers. These controllers need direct line of site with the console to work properly. The d-pad on the controller is rather loose, but I found this was actually a plus, especially when playing Virtual Fighter 2. The buttons are rather high, but they are responsive and overall the controllers work very well. Wired controllers also work with the Genesis console. Pretty much any first or third party controller will work with the base unit. We are not sure about specialty controllers, such as light guns, but everything else we tried worked perfectly. The Genesis portable has a small circular d-pad that works well with most games. We did find it somewhat difficult to pull off a dragon punch in Street Fighter II, but aside from that small complaint, the d-pad is a solid input device. 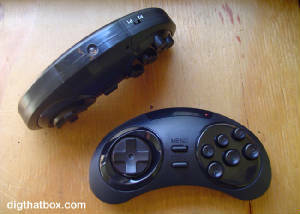 The face buttons mimic the classic six button layout of the Genesis controller. They are comfortable to use and well placed on the face of the machine. They are very responsive and I felt they worked well in games that required a lot of button mashing. 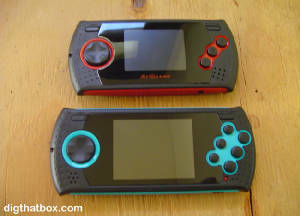 Having followed the AtGames portable Genesis line from the beginning, I can easily say that the newest model greatly improves on the controls, the screen quality and the emulation quality of the earlier models. The game library for each system is roughly the same, with the exception of a few key titles. The portable system comes with three exclusive Capcom games, including two versions of Street Fighter and Mega Man: The Willy Wars (which itself includes three full Mega Man games). The console includes Virtual Fighter 2 and Ristar, both of which are not found on the portable system. 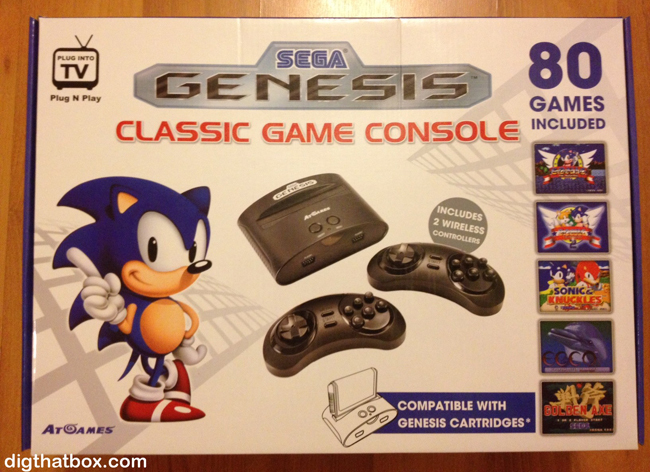 Now there may be some confusion among consumers who buy these products thinking they come with 80 Genesis games. However, if you examine the box for each product, you can see they clearly mention the "bonus" games. But this still won't keep some people from being disappointed with the selection of bonus games. Fortunately, the portable system allows users to add their own games. And the console is said to have an SD card adapter cartridge in the works, which will allow gamers to play their Genesis roms on the AtGames console. The console also supports standard Genesis cartridges, which is a very big plus as they are easy to find and many of them are cheap. We tested the console with a number of different Genesis games, and although we found a few that did not function properly, the vast majority of our collection worked with the AtGames Genesis console. 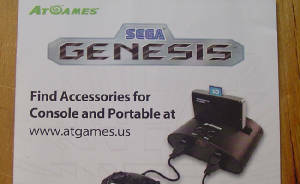 The AtGames Sega Genesis console was actually voted "Best Retro Gaming Product" of E3 Expo 2012. [Source] Unfortunately, at the time of the show we were under strict agreement not to mention the console, which was still several months away from release. Well, now that we have the final product in our hands we can say that it truly deserves that prestigious accolade. Of the two products, my personal favorite is the Genesis Portable. The SD card feature is a nice bonus. The system has a great screen, solid gaming controls and a nice selection of built in games. It also has decent battery life, which is a very important feature for any portable game system. It seems fairly durable. 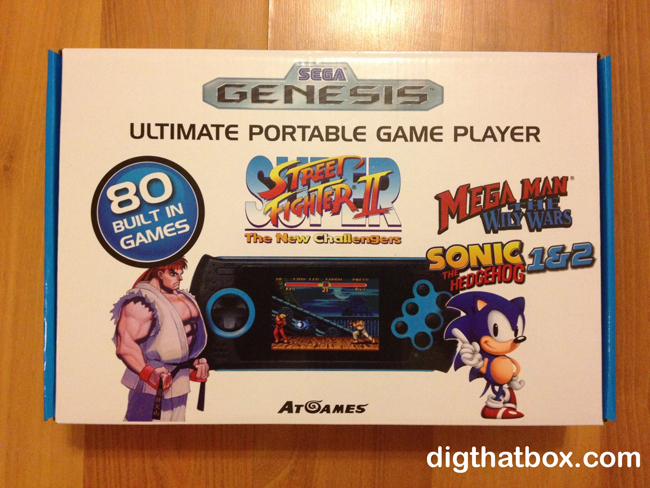 This system is great for anyone looking for Genesis gaming on the go. The bottom line is that you can't go wrong with either product. If you're a Sega Genesis fan looking for a cheap thrill, these products are right up your alley. Both products sell at a MSRP of $40, which is a tremendous value for the money. About The Author: E.Thomas is our resident portable gaming fanatic. He has a massive collection of handheld gaming systems that dates back over 30 years. He is quite literally obsessed with the subject of gaming on the go. And he's always on the look out for the next great portable gaming system.